I have been very busy over the last little while and I thought that I had better bring you up to speed as it were. 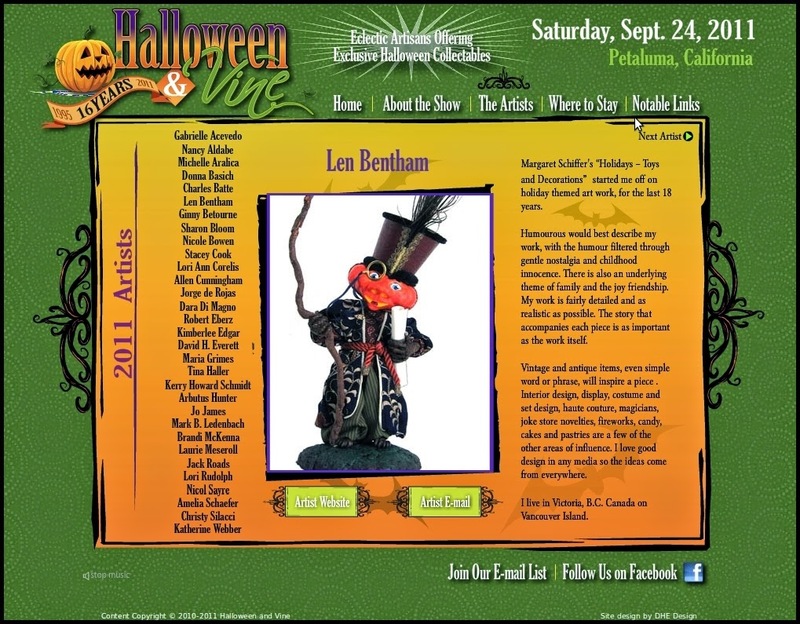 I did mention in this previous post at the very end that I had been accepted into the wonderful Hallowe'en and Vine show in Petaluma, California. Here is what my page looks like in the preview of the artists. Black Cat is rolling his eyes, mentioning under his breath that he did TRY to be my moral compass. He is thoroughly disgusted with my "Blatant bragging self promotion", his words not mine. I can't help it, I am very excited to be included with all of these fine artists. Some of these people have become online friends and I am very excited to meet them in person. I have been working on various pieces for the H&V show. I have nothing to show for it yet. I don't work on one piece at a time. The moulds are just about finished, there are floors that I am working on, a chaise lounge, the tin of lima beans is almost finished, and the list goes on. All of these assorted goodies will start to come together in finished pieces. I will post some of them as they are completed. I did take a break in the midst of all of this to make seven hair ornaments for the bridesmaids and one for the bride, our daughter-in-law-to-be, Nicole. Nicole had mentioned that she was looking at some at a local hat shop. 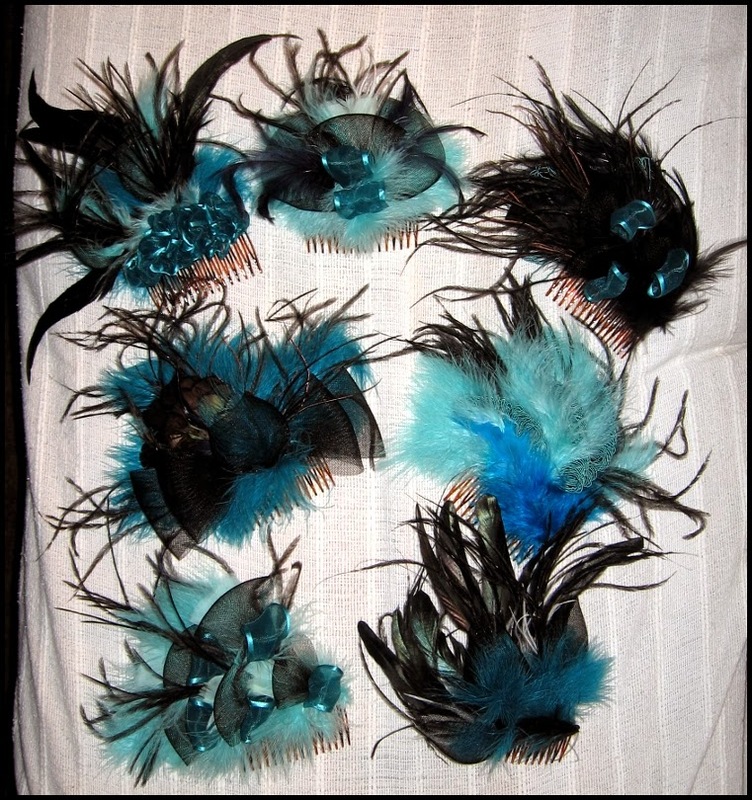 I found out that they are called fascinators. When our daughter was getting married I helped her to put hers together. I wanted to bless my future daughter-in-law, I figure I saved her about $800.00 to $900.00. I will have the wedding photographer photograph each of the bridesmaids and the bride and do a post about them so that you can see them being worn and not just looking like a clump of feathers. 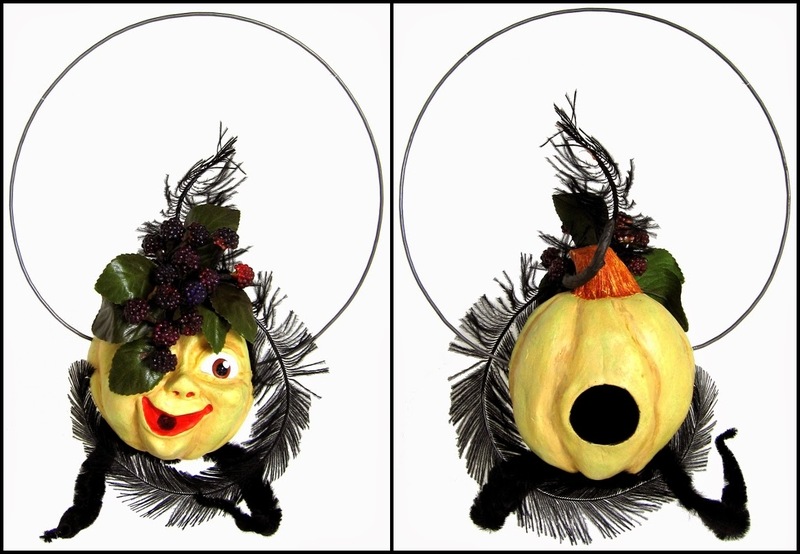 I had no idea what those hair decorations were called at the time when I made the hat for this candy container ornament, "Edna came as a Paris runway model". I find couture millinery very fascinating, it is just another part of the area of costume that is wearable fine art. I am going to be making a series of hats for elegant JOL ladies. The hats will be modeled by the proprietors of the "Jollity Village Hat Shop" and their friends. I am still producing displays for the Hillside Shopping Centre. 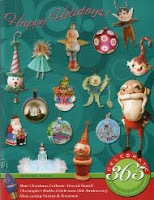 Michele Paget is in charge of marketing for the shopping centre, she is a pleasure to work with. 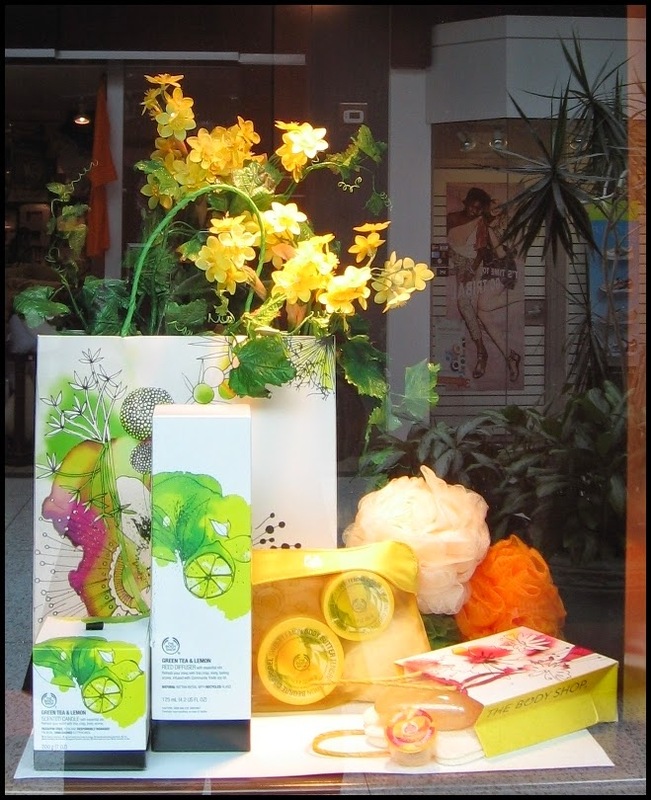 The window display above was done for the Body Shop. I will get pictures of the big Spring window and post them in the near future. 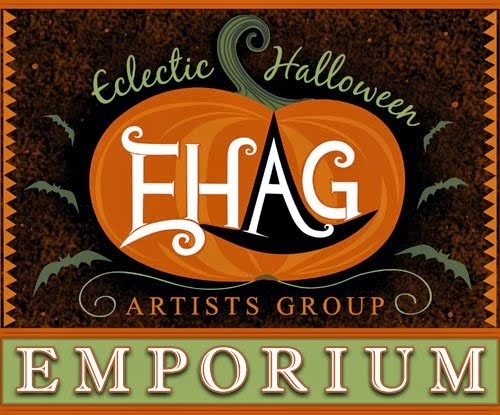 I have not done any work for the EHAG Emporium at all this year. I may do a few pieces in the upcoming months, we shall see. It all depends on how busy I am. Well that about does it. This is a very eclectic posting. I wanted to bring everyone up to date with all that is going on both in the studio and elsewhere. I will try to be a bit more consistent with my blog posts. Thank-you everyone for taking time from your busy day to read my posts, it is very much appreciated. Thank-you so much. I'm looking forward to see what I will be taking as well! I have some ideas but they always change slightly once I start working on them. I've heard about this show in Petaluma before...you will love it! Really enjoyed seeing your window display. What a great gift to your future daughter-in-law. How many future dad-in-law's can do something so fabulous?! Those wedding accessories cost a fortune. I hope you'll post your hats. Can't wait to see them.